In order to have a successful event, you have to be confident in your budget. Do your research; make sure you are hiring vendors that have similar interests. Don’t be afraid to share your bottom line for a dollar amount with your vendors. Tell them what the most important aspect of your event will be for you. Once you are comfortable with the number, stick to it. There is always a way to make something look fabulous, at any price point. A little research and a few phone calls to talk to vendors can do wonders. – Color. Pick one color and an accent color and go with it. (Even “white” is a color!!!). There is nothing like a saturation of a color to give you a lush, luxurious feeling. – Can’t afford lots of flowers? Pick a few beautiful, unusual blooms and surround the flowers with lots of candlelight. 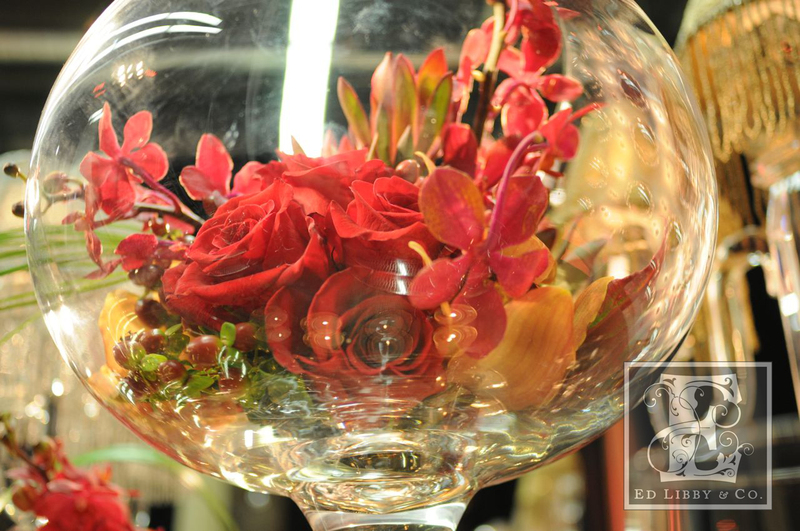 Have the flowers arranged artfully in some beautiful glass. It’s romantic and can make a statement. We used a piece of low glass and designed a beautiful arrangement of orchids and roses. Rich color and an artful design make unique and stunning center pieces. – Perhaps you focus on one major component of your event. What is important to you? Is it the décor, the food you are serving your guests, is it the music? Whatever it is for you, allow that to be your “feature” and every thing else can be designed around that. Don’t be afraid to tell your vendor you can’t afford an extra “something”. Talking about money makes everyone uncomfortable. But if you are honest about your budget with yourself and your vendor, it will make for a smooth planning process and an even more enjoyable experience! ← My friend James Rosselle…on Craftsy.com!